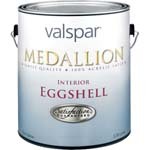 Paint Store :: Shop by Brand :: Valspar :: VALSPAR 4402 MEDALLION INT ACRYLIC LATEX EGGSHELL TINT BASE SIZE:1 GALLON. This durable wall enamel protects with a 100% acrylic coating for long lasting interior beauty. The eggshell finish provides a low sheen that resists stains and fingerprints. Dries quickly and cleans up easily with soap and water. WATCO 63131 LACQUER CLEAR WOOD FINISH SEMIGLOSS SIZE:1 GALLON. KRYLON 3541 SPRAY INDOOR OUTDOOR HOSTA LEAF SIZE:12 OZ. SPRAY PACK:6 PCS. WOOSTER 4183 ULTRA PRO FIRM LYNX BRUSH SIZE:3" PACK:6 PCS.